So my best friend is getting married and I am honored to be…The Maid of Honor. I admit, I’ve secretly been waiting for this moment ever since I was a little girl. I mean, other than being the actual bride, this is THE most important position in a wedding party. Why? Because you get to plan!! Now, I’ve had friends who were the MOH at weddings before and alllll they did afterwards was complain about how stressful it was, how much money they spent, and that by the end of it…being MOH was not all it’s cracked up to be. Lucky for my best friend — I plan on being the MOH OF ALL MOHers. That’s right. I even changed my title to POH (Planner of Honor) because I thought it was a better fit – lets be real. I’ll never aspire to be anyone’s maid, that’s like almost calling me a servant and sorry that is just not my style .. So how do I plan on achieving these POH duties? What do you need to do, to be the MOH of all MOHers.. Here’s what. 1. Have a Pre-Wedding talk with your bride. Once the official announcement is out there, sit down with your bride and find out specifically what areas of the planning process she wants you to be involved in. Find out what areas she feels she’s got covered and what you can start planning. You don’t want to step on toes and brides tend to be a bit overzealous in the beginnings of the planning stages… So, having a pre-defined role lets you know what is expected of you and also lets you begin your MOH timeline. After your duties are outlined, get on that timeline. 2. Start a MOH Timeline. The MOH timeline basically is a list of things you need to get done and when you need to have them accomplished by. Setting deadlines will make it easier to figure out the details of the bachelorette, the bridal shower, bridesmaid dress shopping, writing your speech etc. 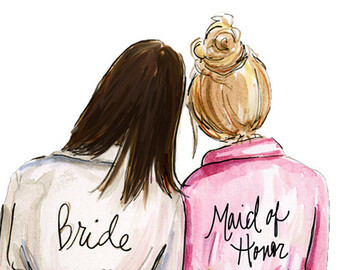 Every bride has a timeline and so should her MOH. You’d be surprised how much coordination is involved in planning these preceding festivities! Not only is everyone looking to you to plan, but you also need to coordinate all the small details for these important events. Like what’s the theme for the Bach? Where are we going? ..You’ll be fielding question after question, so be organized… And enlist the help of the bridal party! 3. Communicate with the bridal party. The bridal party and the MOH should be a united force of bridal bees. These are the ladies whose primary interest should be to help the bride, and by helping the bride, that means helping you. I think a lot of MOHers get stressed out because they feel like they have to do it all, no you don’t. That’s why there is a bridal party. Ask for help! Whether it’s collecting funds to cover the bride’s bottomless drinks on the bachelorette, or asking for someone to find the restaurant and make a reservation. The bridal party is the committee of planners and without them, you are sure to be one crazy out MOH. Just like the MOH has the potential to be stressed, the bride is expected to be stressed out. Especially as the I DO date gets closer and closer. So, drop her a line and find out if there is anything else she thought she could do, but just doesn’t have the time anymore. Step in and take it over. That might mean gluing a thousand tiny pieces together, that will surely become a wonderful wedding favor, licking 200 envelopes, or scouting out activities. Whatever she needs, you are it! You — MOH — are the answer! She’ll thank you (or maybe she’ll forget..but.. you’ll know). OR TRY TO. My bride-to-be has made many jokes that she will be fanning ME and telling ME to calm down before the ceremony. And all jokes aside this scenario is entirely possible. However, do your best to keep yourself level-headed. Also, no one wants to be the MOHZILLA that all the bridesmaids end up hating (… some haters gonna hate’ regardless..just sayin’…) BUT do your best to be fair, stay calm, and reassure your bride that her wedding is going to be flawless. And it will be. 6. Give her a night to remember. Go BIG on the Bachelorette Party! The truth is, any wedding is stressful during the planning process. You are going to be expected to remember everything and THEN remember everything that you could have forgotten. Being the MOH is a big deal, and your bride picked you because she knew you could handle it. So, go big on the Bachelorette. Give her one night out with her bestests to make her forget about starving to fit into that wedding dress, or the million calls a day she is getting from her mother-in-law (just to “check in”). Give her a night to forget all the silly things that brides have to deal with before they are about to say ‘i do’. Plan something FUN and plan something that you know she and everyone invited will enjoy. This is her last night as a single woman. Go big or go home. ← The Art of Friendship.